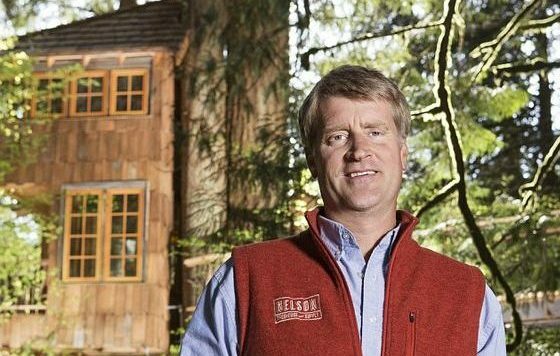 This week we pull up a tree stump next to Pete Nelson, a poet, master craftsman, and the host of Animal Planet’s Treehouse Masters. And when you talk to a man like Pete – well, that’s when you tend to discuss a lot of manly stuff, including finding your success, treehouses that could kill you, carbon fiber, and the plans for his latest project with Dove Men + Care, called the Element Treehouse. This was the kind of opportunity that could earn a man his ‘man card‘… and so we made the most of it. Urbasm: Hey Pete! What’s been going on? Pete Nelson: We’ve been busy. We’ve been on a TV schedule for five years now, which had a pretty hellacious learning curve at first to keep up with the demand. I was unaware of the demand of a television show when I signed up for this. Pete Nelson: But I’ve been trained and now I’m really proud of everybody, and not just my guys that help me build, but the production company that films all this. We have an amazing thing going. We’ve been working on jobs all over the country, but the one that we’re concentrating at this moment is in Chattanooga Tennessee for Dove Men + Care. Pete Nelson: I feel so fortunate because I have this fantasy job where I build forts. Dove came to me and said they wanted to do something around their new line of natural products, called Elements. 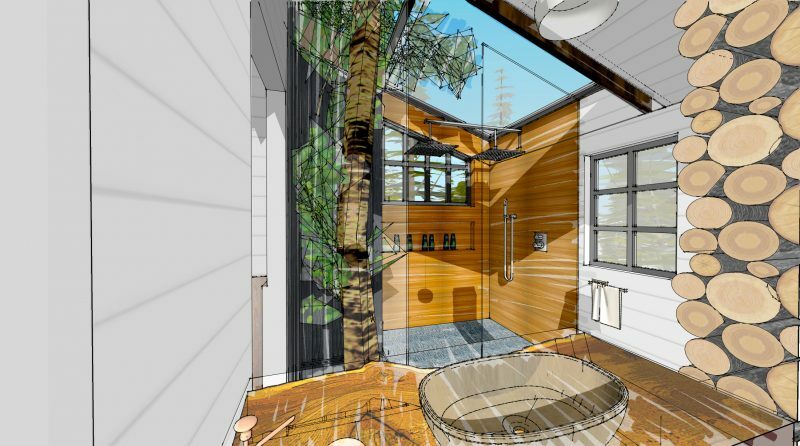 It became clear that what we needed to do was build a spa/bathhouse treehouse. Urbasm: Sounds like a big project? Pete Nelson: We are hoping that we are going to be able to get this built in the late Spring so that people can actually spend the night. 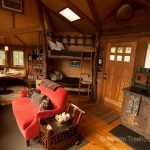 People are going to be able to potentially win a stay in this treehouse, and that makes it the most fun – as it is something to be shared – getting people into nature. 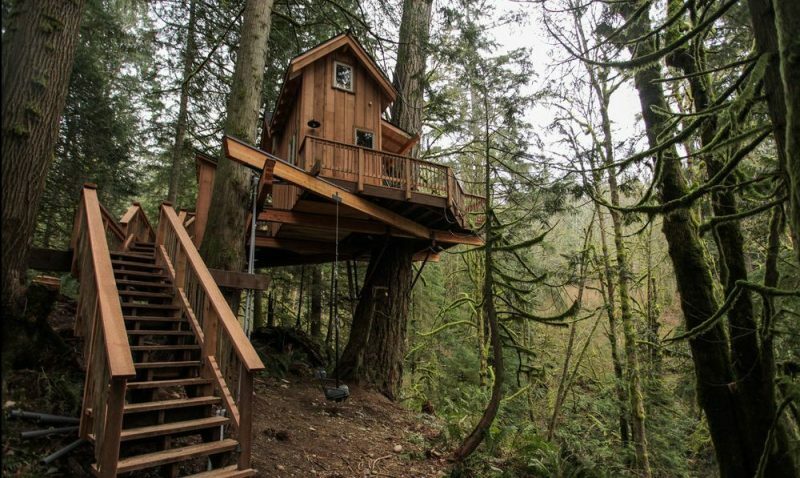 Enter here for your chance to stay in the Elements Treehouse. Pete Nelson: We are working to include all of the essences of the Elements line. Mineral and sage is my favorite one, so we’re thinking of bringing in a live wall with some sage. The other product is charcoal and clay. The charcoal element will be cool because we’ve been excited about using a Japanese woodworking technique where you char the wood by taking a flame and burning the wood. It is called the Shou Sugi Ban technique. Urbasm: Very cool, and we’d imagine it’s going to have an awesome bathroom, right? Pete Nelson: I just see water, water, water… and more water. So, a big drain will be in the middle of the floor. And we’ve got some sandalwood – that is another one of the elements. We can incorporate that into the countertops. We are going to make this a fully natural, sustainable treehouse. Then, all of a sudden – Boom, we’re going to be done, and we’ll have another treehouse under our belt (laughs). Urbasm: (laughs) That’s how it’s done. Urbasm: You are a lucky man. Pete Nelson: I know it. Urbasm: And you’ve built treehouses all over the world. 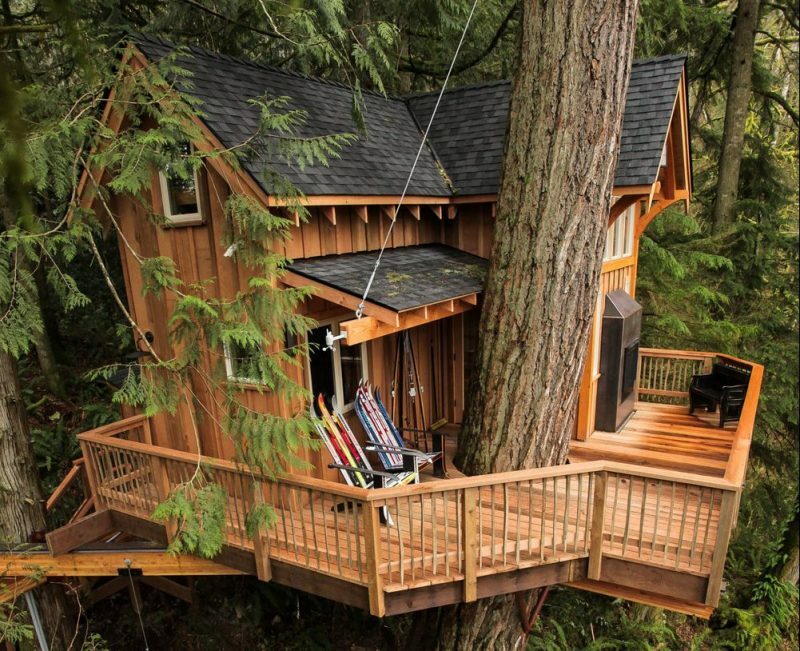 But if you could build a treehouse somewhere that you have not been – where would that be? Pete Nelson: I love to travel, and we – my family – were toying with the idea of going to Africa. And then you asked me that question – and I’ve still got Africa on my mind. So maybe Botswana, or something like that. Overlooking the Zambezi River in some hippopotamus area. That is on my bucket list. 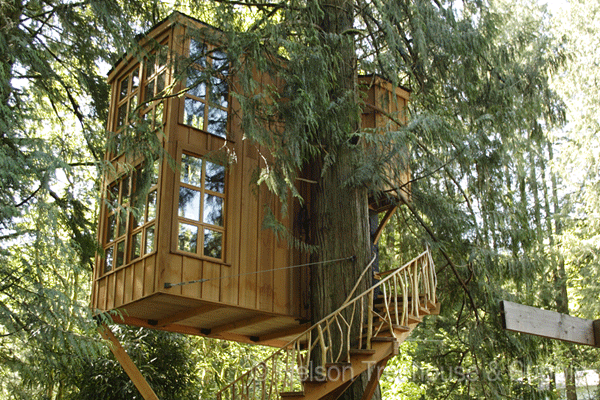 Pete Nelson: Believe it or not, we built a treehouse in Morocco in 2004. We’ve built treehouses in seven countries now – Spain, Germany, and Japan… and we’re about to go to Norway and build a treehouse in April. I haven’t been to Costa Rica yet, which is sort of a sin I think. I need to put that on my bucket list too. 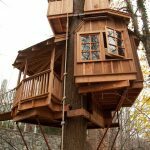 Urbasm: Are there any places where a person shouldn’t build a treehouse? Pete Nelson: Yes, there are plenty. You need to be careful about some basics. I learned that in Texas – the hill country – they have floods that are pretty extraordinary. Texas went through a long drought, and then in the last two years, they have had a number of floods. We’ve been through a few and it is remarkable how serious that can be. Investigate where you are in terms of big floods, eroding hillsides. I don’t want to get too technical, but there is a pretty basic way to look at how much movement there might be on a hillside. It is simply looking at the trees themselves. If they have a big bow or curve in them – that is generally indicating that the soil underneath and the root ball is moving downhill, and the tree is bending to seek the sun. 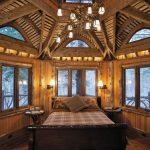 Pete Nelson: And obviously, you don’t want to build in trees that don’t last a long time. The basics are redwoods – they last for thousands of years. We have a lot of great hardwoods in the North East, like maples and oaks – and there are some good pines. In Colorado, the one tree I would avoid is the cottonwood. Those tend to drop their branches in big dangerous ways. And as beautiful as Aspens are, they are kind of a small tree. If you wanted to build in Aspens, I would augment your platform with some posts, and I think that can be done in a nice way and nobody would even know the difference. Urbasm: What is the most outlandish client request you’ve ever received? Pete Nelson: Most of them come from children. A bowling alley was one of my favorites (laughs). Swimming pools – you know, those sorts of wonderful ideas. But generally speaking – anything you can think of we can do. Urbasm: And that brings up a question. 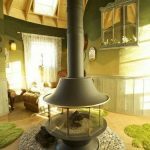 Is there is an amazing treehouse design on your mind that technology has yet to allow you to accomplish? Pete Nelson: That is a neat question, and I do look forward to the materials of the future. We are woods guys. Wood is such a great material to work with. So, we’re kind of stuck on some of that, but I’m fascinated by what some of the newer materials can do. We’ve been using steel in the beams and substructure now for a few years, and getting greater spans – but I am looking forward to what we could do with technology that would allow us to incorporate wood into larger spans. 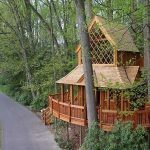 I am big into open areas, and treehouses by their nature are small structures, so we don’t have a lot of spans that are limited by the distance between trees. But being stuck in one tree is limiting in some sense. I don’t know if I will be going to carbon fiber anytime soon, but if that helps accomplish whatever challenge arises, then we’d certainly be open to it. 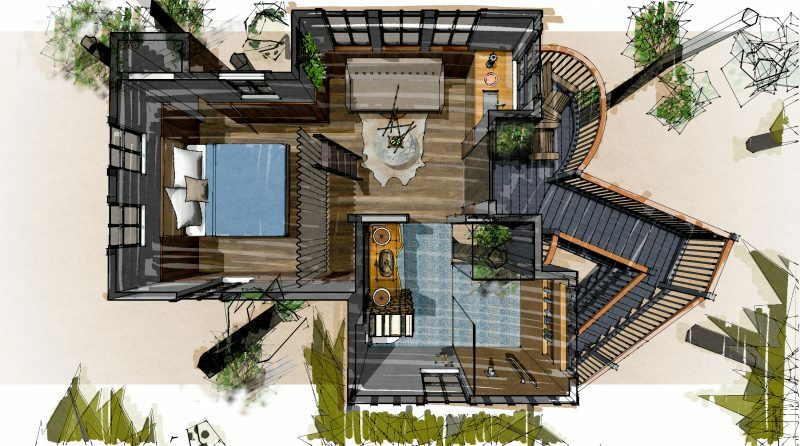 Urbasm: Describe what your ultimate bachelor pad treehouse would look like? Voice in the background: Where are you going with that? Pete Nelson: A couch. Just a place to disconnect and think. Oh, important – A great stereo system. I will not have a television – but I would have a stereo. I might even have my vinyl collection up there. I am inspired by music a lot. And when my buddies came up, I would have a bar for them. It would only be twelve feet up, but the back of it would be hanging over a cliff, so I would be infinitely high off the ground. Pete Nelson: That’s it. And a roof, of course. Oh, and a fireplace because I love real fire and I want to keep warm in the winter. Pete Nelson: I forgot the deck. You’ve got to have an outside deck. And a little cover over the deck in case it’s raining. Urbasm: What advice would you give other men for how to achieve their dream career as you have? Pete Nelson: I love this. Okay, so Joseph Campbell talks about following your bliss. The bliss is a little different than what I thought it was. It is your passion. So, I’ve been thinking a lot about that lately. Your passion is one thing. I love my music – but I am not a guitar player. If I were to follow that passion, I would be a broke musician. I think the important part of this bliss is that it is your gift, and your gift is that thing you know in your heart that you might be really good at. Better than most people you know. The point is – you go towards that thing that you naturally have as your gift. If you can find that bliss and develop that, it can be what you do for a living. And as they say, it will never be a job. It will be a pleasure to go to work, even on a Monday. Urbasm: You’re definitely on to something, Pete. And finally, what three things do you think every man should know, according to you? Pete Nelson: Number one, find that gift that you have within. Work like mad to find that talent you have that is uniquely yours. The second thing is – in my case, one of my best decisions was to follow my wife in where she wanted to live. Urbasm: Happy wife – happy life. Can’t go wrong with that. Stay current with your taxes. Urbasm: (laughs) Now there’s some advice a man doesn’t hear often enough. Pete Nelson: That’s a good one because they don’t go away. I wish they taught us that in college. Pete Nelson: Oh, and here comes the pizza… (silence) Oh sorry. Urbasm: (laughs) And that must be our cue to exit. Thanks a lot, Pete. 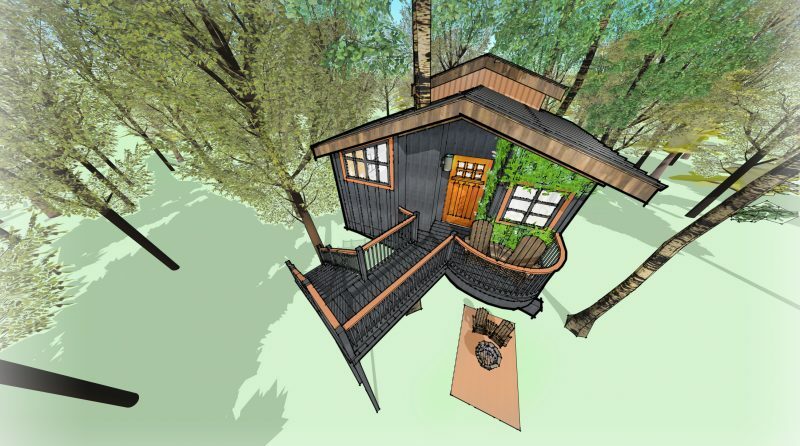 We look forward to seeing the completion of the Elements treehouse.